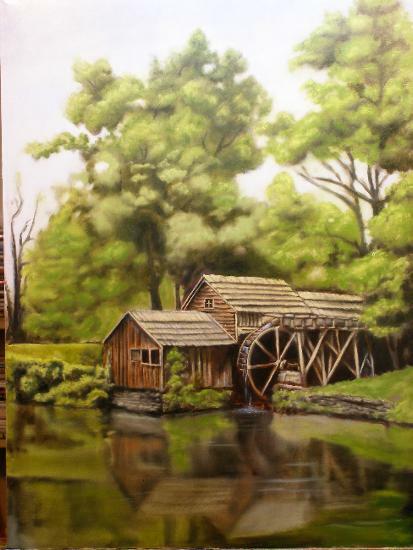 Landscape Painting using the indirect method for Mabry Mill, a local Virginia landmark. 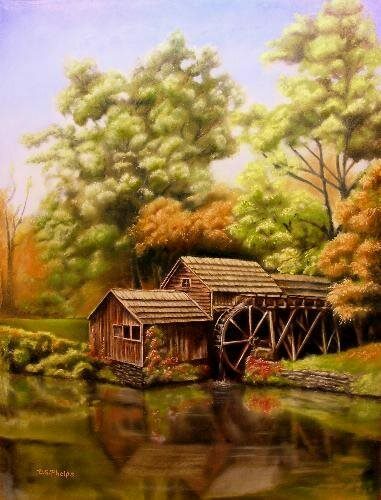 A landscape painting demonstration using the indirect method is discussed in this article. These procedures normally involve several layers of paint, one over top the other but not always covering the underlying layer. These first layers are usually pretty loose, but it can be done in which the under-painting is very near completion with fine details included already. Many artist's in the past employ this form of painting. 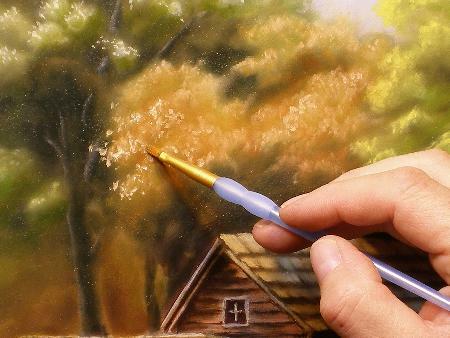 Artists including Van Eyck, El Greco, and Rembrandt used these techniques in their paintings. A few things to always remember when painting indirect, is to follow the fat over lean concept. Another thing to remember is that in the color layers, many changes can take place that you may not have considered, so think about what your final statement is going to be in those regards. Lets take this example. Say you have a dried yellow layer color on the canvas. You come back over with a cadmium red, very thickly. This can obscure the yellow altogether. Thin the red just a bit and you now have a very vibrant orange on your canvas due to the optical blend of paints. This can be obtained also with the heavy red and a brush stroke that allows the underlying yellow to show in between. Your eye will turn this to orange. Now this orange on your canvas is a completely different orange, then what you would have achieved by mixing red and yellow on the palette. The indirect mixing of colors is said to give a more luminous vibration, rather like that seen in stained glass when light passes through it. To see it for yourself, make a color chart and experiment with a few colors over top of others to see their resulting effect. By exploiting this characteristic of the oil painting technique, painters found that they could develop a much more brilliant luminosity whose character was unobtainable in the direct techniques. The procedures most commonly used in indirect painting are called glazing and stumbling. These methods can be used in still life, portrait and as in this demo, landscape painting. So onto my short demo here of a landscape painting using the indirect method. Following the usual coarse of preparing the canvas up through toning the canvas using a short cut described in my e-book, we're now ready to transfer the drawing onto the canvas. 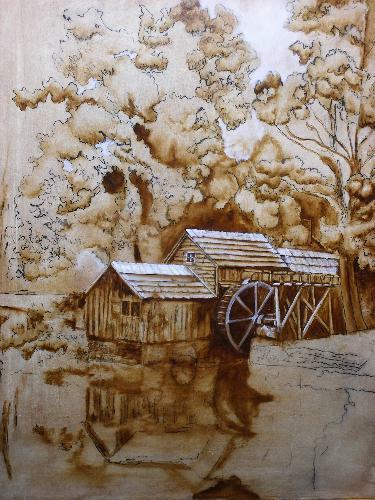 In this piece, I used the Artograph Designer Projector to copy the main mill buildings and some of the surrounding trees. I get out my reference material which come from photo's through several seasons, both my own and some from the web through royalty free sites. Here we see the umber under-painting with the addition of white in areas that I wanted to keep bright. You can see the underlying drawing showing through quite a bit in these photo's. Continuing with the dead or gray under painting layer, you see, much of the umber under layer is showing through for the buildings as they are naturally brown and grey, depending on the age of the siding. Proceeding along with the color layers. 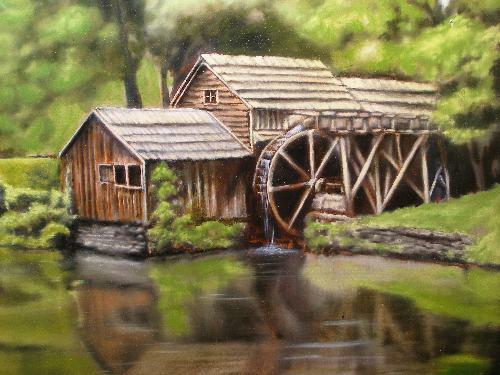 There are several of these as my painting was first starting out as a summer scene. And then changed to incorporate more fall colors. Close up of the mill at this point. 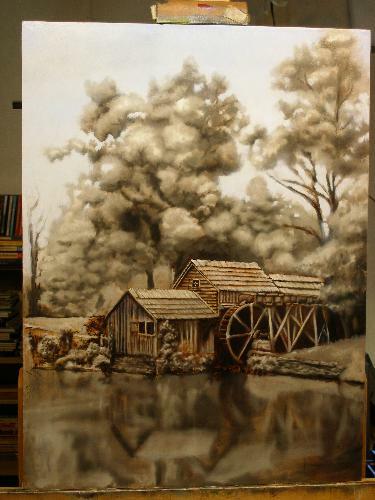 I began putting in some different colors, as the trees around my house were beginning to change, I translated these colors onto my canvas as I wanted my Mill to have the same colorful background. And my final finishing layer with the autumn theme fully incorporated. Want to paint this image! Click Me! I know this is but a short landscape painting demonstration, but that is due to this particular painting being the subject of a new electronic book that is now completed. For those interested, check here for all the details of what is included in this E-book. It's not just landscape information. The first revisions are completed, and the link is live! Come see this "better than my first e-book" demonstration! 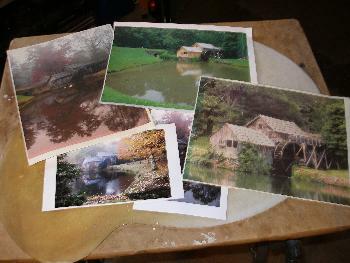 Over 100 pages and 200 photo's to describe in detail, step by step, the struggles of this artist and a favorite Virginia Landmark. I also want to give a quick shout out to Roena King and Paul Baswell, both are contributors to the site, and have been instrumental in getting me through this painting. Without their help, it simply wouldn't have happened! It's been awhile since I've done a landscape painting and the challenges were well worth the effort. Their keen eyes and help in critiquing have made what would have been a mediocre painting become not only a great painting, but one that will be the subject of an entire e-book. What people are saying about the E-book. Astoundingly beautiful art, well written instructions. THANKS! Thanks Delmus your e-book is great, I see things I've been doing wrong already. Thanks a lot for this incredible lesson! Very useful information. Highest recommendation! Fantastic teaching! Thank you for this affordable purchase. Excellent seller! Excellent product! Recommend!! Very informative detailed material, much better than Ca&%er method! Thank you~ the ebook is absolutely beautiful, thank you for sharing your talent!